The EU has agreed to accelerate the accession process for Turkey and relax visa restrictions as well as giving them a £2.2bn bung to get them to make an effort to stop illegal immigrants travelling through the country to Europe. Under the deal around 77m Turks will get the right to visa free travel throughout the Schengen zone as early as the first half of next year. The UK's contribution to the £2.2bn bill is expected to be around £260m, or the wages of 9,880 nurses. 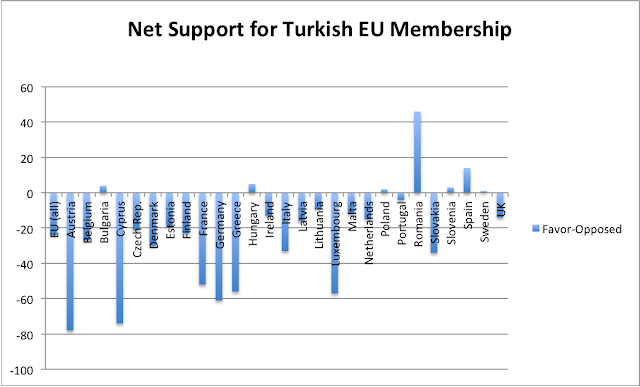 The 2008 eurobarometer gauged support for Turkey joining the EU and found that a majority of people in almost every EU member state were opposed and quite comprehensively so in France and Germany.